For 13 Trevecca students, the weekend before Thanksgiving break was spent winning the title of the Tennessee Intercollegiate State Legislature best delegation in Middle Tennessee. For the second year in a row, Bronwyn Kircher sat in the same seat as legislators for the Tennessee General Assembly, hearing bill proposals from other students from Tennessee universities. 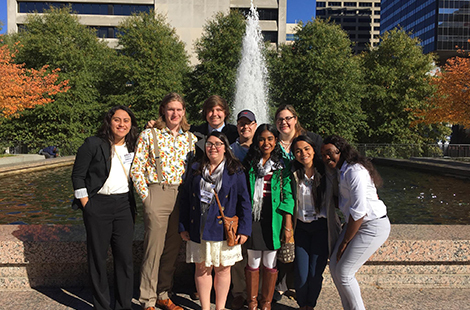 She and 12 other Trevecca students were there for the Tennessee Intercollegiate State Legislature (TISL), a four-day convention for college students to learn how the government works by participating in an intercollegiate supreme court and an appellate mock court session. Kircher, senior history and political science double major and head delegate for Trevecca’s TISL delegation, said none of them expected to win anything—much less the title of best delegation in Middle Tennessee. “We went into the weekend not really expecting to win much. Being a small school, we often get overlooked by schools like Vanderbilt and the University of Tennessee Knoxville when it comes to winning things,” said Kircher. Not only did Trevecca’s group win best delegation in Middle Tennessee, freshman community development major Chuck Layne won best lobbyist for his firm on business and private interests and was nominated for a Tennessee Student Assistance Corporation board position. Trevecca’s delegation consisted of two senators, two representatives, three lobbyists, five AMC3 lawyers and one assistant clerk of the house. Erica Hayden, assistant professor of history, taught the one-credit hour TISL class at Trevecca and served as the delegation’s advisor. As part of the class, the delegation team went over the basics of TISL, parliamentary procedure and Robert’s Rules of Order. They also wrote bills and prepared briefs on freedom of religion and civil rights for the moot court session. The bill the delegation proposed was written by Tishara Davis about naming rights for historical buildings. This topic came about in response to Vanderbilt University’s Confederate Memorial Hall. “Tishara was saying we should be very careful about changing names that erase history—we should learn from the past—and by taking names away, are we actually forgetting what it stood for? Are we going to whitewash the Civil War? It’s an interesting approach because a lot of people are saying we shouldn’t memorialize and honor a group of people who owned slaves and wanted to keep slavery intact. She raises a really good point that if you take it away, what about younger generations that might not realize the import of all of that,” said Hayden. Hayden was not at the capitol to celebrate with the students, but she said she got a phone call as soon as the win was announced. “I got a phone call from Bronwyn the day it happened. They were really pleased they were recognized as a small school. They embodied the spirit of what TISL was about, and the fact that a smaller school like Trevecca could go in and make their name known was a really big deal. It made them feel like their time and effort were recognized,” said Hayden. Hayden said TISL is great for students who are interested in making a difference at the community, state or federal level. “Getting involved and understanding how your government is really important, and this is a low-stake way to see how government works, get involved with lobbying and see how decisions are made. For people who think they might want to go into politics, law, or advocacy, it’s a great way to see what those worlds are like. These students really are making a difference and they are thinking very seriously about issues that they see in their state,” said Hayden. Layne said more people involved with local and state government and encouraged others interested in TISL to consider participating. “Everything is a learning opportunity, and we need more people taking an interest and getting involved with local and state government. People are entitled to an informed opinion—you can’t have an informed opinion if you don’t develop your convictions. Don’t just be consumed by the echo chamber that is so prevalent today,” said Layne.